Talking to animals in Spanish can help children learn language. You can enlist the help of animal friends in several different ways. First, animals provide an audience for you to hold a one-sided conversation and describe what you are doing when kids are present. In addition, talking to animals in Spanish as you normally would in English, with all the normal dog or cat phrases, lets kids hear repeated language in specific situations. Finally, pets can provide a receptive, non-judgmental audience for kids to read or sing to. Hola, ya regresamos. Voy a cerrar la puerta. Buen chico. Ahora Olivia va a hacer su tarea. Yo tengo que recoger un poco. ¿Nos vas a acompañar? (On a walk). ¿Te gusta pasear, verdad? ¿Ves esas flores bonitas? Me encantan. Of course, you can and should describe what you are doing to your child. However, there are times when kids are tired, or prefer not to be directly engaged for any number of reasons. This is especially true as kids get older and narrating what you are doing is not as age appropriate. At those moments, a conversation with the dog can provide important exposure to Spanish. When we talk to animals and give them commands, we tend to use a limited vocabulary in a specific context. Children will hear the same phrases repeated in situations that makes their meaning clear. You can find some of those phrases in the list below and on websites of common commands for dogs. The idea is not to confuse your pets! Dogs often respond to our tone of voice and visual clues, so in some circumstances talking to animals in Spanish is not a problem. For example, saying buen perro with the same affection and enthusiasm that you say “good dog” will be interpreted the same way. The same is true of saying ¿Quieres salir? (Do you want to go out?) while you are holding the leash. If you are giving your dog a direct command, be sure to accompany the Spanish command with the English that your dog understands, at least at first. Learning Spanish is important, but consider your dog’s personality and what is best for the four-legged members of your family too. 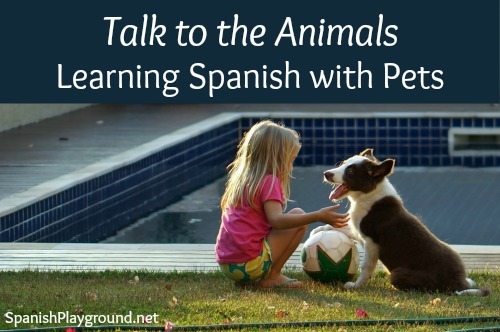 Here are a few common phrases we use when talking to animals in Spanish. Be sure to make the adjectives feminine if your pet is female. ¿Quieres salir? – Do you want to go out? ¿Quieres comer? – Do you want to eat? Come tu comida. – Eat your food. Toma tu agua. – Drink your water. Quieto. – Quiet, be still. Also used for the command Stay. No ladres. – Don’t bark. Cállate. Silencio. Ándate a tu cáma / Anda, échate en tu cama. – Go lie on your bed. Trae. Tráelo/la. – Fetch. Fetch it. Vamos. – Come on (on a leash). Bájate (when a dog jumps on a person or the furniture). – Off. ¡Bien! / Muy bien – Praise for doing something. Dáme. / Deja. / Suelta. – Give (to release a ball or something a dog is holding in his mouth). Mira / Mírame – Look (to get his attention or show him something). Tranquilo. – Easy. Calm down. Qué hermoso perro / gato. – Such a pretty dog. Qué lindo eres. – How pretty you are. Qué bello. – How pretty. Buen can. – Good dog. Ven, te rasgo / Te hago cariño. – Come here. I’ll pet you. Language takes practice. Kids need the opportunity to produce Spanish in comfortable, relaxed settings. Singing, reading or talking to animals in Spanish can provide kids with valuable language practice. How you help create these situations will depend on your child and your pet, but do keep your animals in mind as language learning allies. Little ones may “teach” the dog his body parts in Spanish or sing new song. Older kids may read aloud to the cat. However, it works out in your household, the odds are that both kids and animals will benefit.